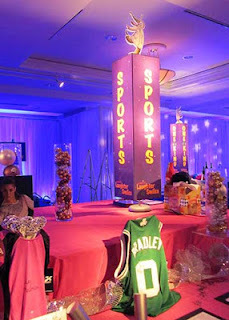 Sports themed Bar Mitzvahs are fairly common, but we often find it hard to come up with original centerpieces. This tall base holds a football - but it could just as well hold a basketball or soccer ball - and also features a custom logo mark. 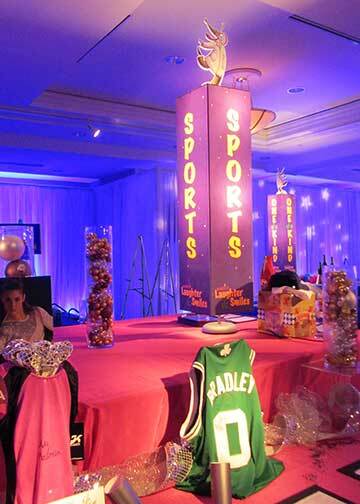 The height helps to fill a large event space nicely. 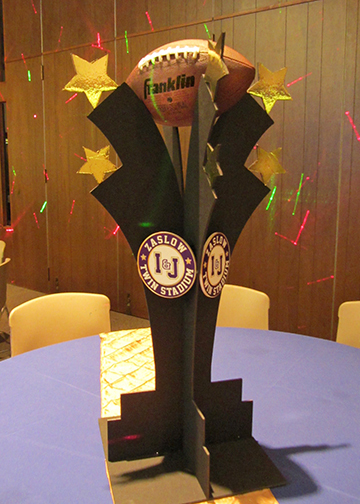 We can of course custom design a base that fits perfectly with your Bar Mitzvah decor. Give us a call to discuss at 781-444-7770! 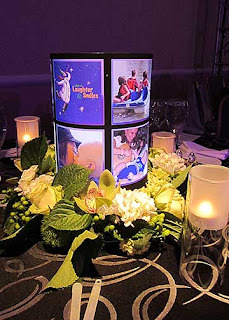 We were delighted to create decor and centerpieces for this years Children's Hospital League Gala. 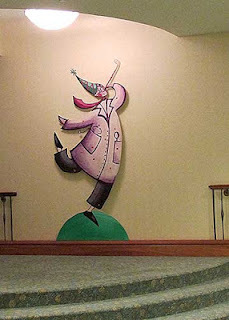 Their artwork featured a "Dancing Doctor" that brought an instant smile to all and a joyfulness to the whole project. 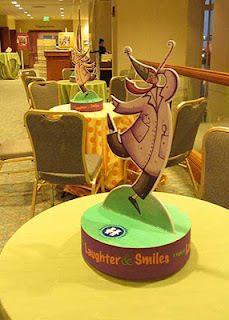 The evening was aptly named "A Night of Laughter and Smiles". And as large decorative elements throughout the event spaces. This year we combined our light up centerpieces for the main ballroom with stunning arrangements by Stapleton Floral. They worked beautifully with the lit column that featured photos of the different services that the League provides to children and families in need at the hospital. We introduced a new find; a rotating photo cube. The cube highlights 6 images as it rotates on one point. Fun! and a great decorative element we have used a few times since. Here is the Dancing Doctor on our rotating centerpiece.